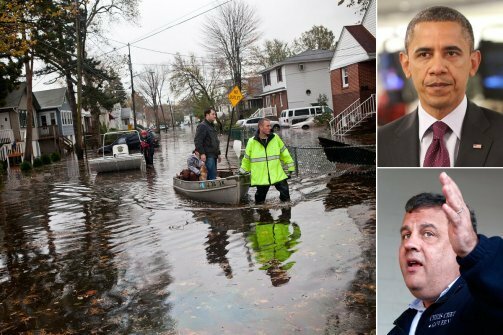 President Barack Obama is visiting the state of New Jersey, to survey the devastation two days after Hurricane Sandy made landfall nearby. With Republican Governor Chris Christie, he is to meet rescue workers and residents in Atlantic City. The massive cyclone killed at least 50 people across the north-eastern US and millions are still without power. Some businesses and services reopened after a two-day forced closure, and Wall Street is trading again. President Barack Obama has put campaigning on hold for a third day ahead of next Tuesday’s US election, as he directs the federal response to the storm. Initial estimates suggest the cost of clearing up after the storm could total as much as $30-40 billion. New Jersey’s Republican governor has lavishly praised the Democratic president for his leadership. Republican presidential nominee Mitt Romney cancelled campaign events during the height of the disaster, but was back on the trail on Wednesday in the crucial swing state of Florida. Across the north-east, 6.2 million homes and businesses are without power because of the storm, says the US Department of Energy. New York, which is also counting the cost of Sandy’s trail of destruction, is slowly getting on the move again. Hurricane Sandy brought a record storm surge of almost 14 ft (4.2 m) to central Manhattan, well above the previous record of 10ft during Hurricane Donna in 1960, the National Weather Service said. The unprecedented water levels brought blackouts across lower Manhattan and other parts of the city. The New York Stock Exchange reopened on Wednesday, albeit on running on generator power. The Nasdaq was also back in business after two days’ closure. Partial subway service is due to begin running on Thursday in New York City, which was paralyzed by chronic traffic gridlock in Wednesday’s rush hour. Many bus services have already resumed, and most of the city’s bridges have re-opened. Flights started arriving at JFK and Newark Liberty airports on Wednesday morning, but the city’s LaGuardia airport remains closed. In all, storm Sandy has claimed some 120 lives, after killing nearly 70 people as it hit the Caribbean. Impoverished Haiti is facing severe food shortages after 70% of crops were destroyed by the storm, officials said.